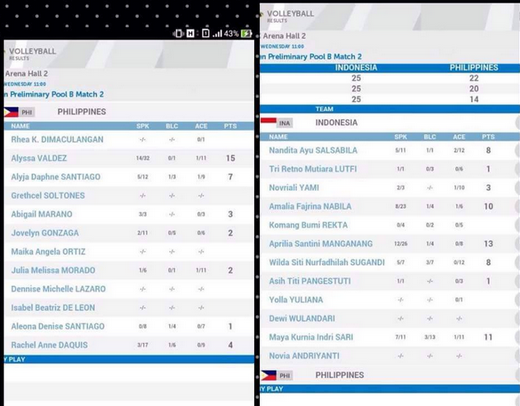 Alyssa Valdez outscores Aprilia Manganang of Indonesia in SEA Games Women's Volleyball Showdown: Look at Their Stats Here! The Philippines loses to Indonesia in straight sets: 25-22, 25- 20, and 25-14 in the opening salvo of the SEA Games 2015 Women's Volleyball tournament. The main factor in this game is that Indonesia had three players with double-figure outputs (Nabila 10, Manganang 13, Sari 11) while Philippines relied solely on Alyssa Valdez's 15 points. But hey, on the brighter side, we can claim that Alyssa is better than the player that has gender related issues, Aprilia Manganang.